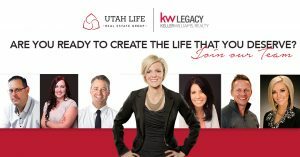 The Utah Life Real Estate Group at KW Legacy Keller Williams Realty is one of the top real estate teams in Utah with over 165 home sales in 2016. We are looking for a self motivated sales agent that has the potential and talent to help us continue to grow. An opportunity to join our team will allow you to enjoy full administrative support, a department of lead generation, top agents who coach and lead them to successful and profitable careers. We are looking for someone that… Prospects for, follows-up with, presents to, and services buyers and sellers. This results in effective conversion rates for leads into appointments, appointments into buyer and listing agreements, and agreements into accepted purchase contracts. Develops expert knowledge regarding mortgage financing, the neighborhoods, schools, and all issues regarding home ownership. Provides high-level fiduciary needs analysis and coordinates a time-efficient home search and home sale process. Consults with clients to ensure fiduciary service of Real Estate transaction from initial contact through contract to close. (Coordinates with the Transaction Coordinator.) Effectively negotiates for all buyer and seller clients.